Native to Europe. Introduced for aphid control. Escaped and naturalized. Meadows, fields, gardens, houses. Any place having plants with aphids. This is a ¼″ to 5 ⁄16″ long ladybird beetle. The body is oval and dome-shaped. The head and thorax plate (pronotum) is black with a white or pale spot on each side of the head. The thick, hardened, shell-like forewings (elytra) are orange or red with 7 black spots. The spots are in a 1–4–2 pattern. The forward spot is spread over the junction of the two elytra. There is a white spot at the base of each side of the forward spot. Aphids, thrips, mites, scale insects, and eggs of butterflies and moths. Adults live for weeks or months, depending on availability of food. There may be 1 or 2 generations in a year before adults enter hibernation for overwintering. Sources: 7, 24, 27, 29, 30. 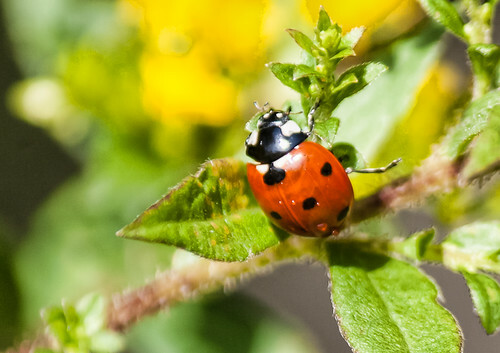 The term lady beetle is more appropriate than ladybug because the word “bug” refers to insects in the order Hemiptera. In this clip I used the Raynox DCR-250 (8-diopter) macro conversion lens which comes with UAC2000 universal adapter. For the Canon Legria HF200 you need the RA5237A adapter ring. This Seven-spotted Lady Beetle (Coccinella septempunctata) pauses to groom itself before continuing its lichen-paved trek. According to Eaton and Kaufman, this introduced species (the C-7) "has been spreading since its accidental introduction to Bergen County, New Jersey, in 1973." It's well-established in Minnesota and North Dakota now. Photographed at Fisher, Minnesota (06 June 2013).